One of the nicest things about having an almost-seven-year-old is that you generally don't have to stay when they're at birthday parties. Lucas went to a crazy golf party on Saturday--birthday parties are very different these days--so Dave and I pottered around the shops in the sunshine. 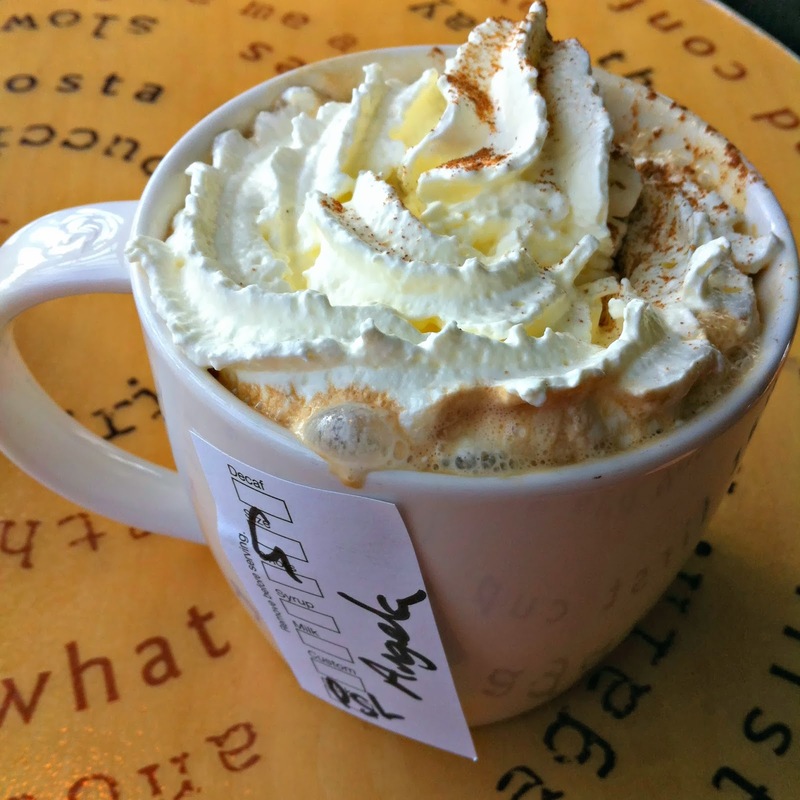 Pumpkin Spice Latte @ Starbucks. I need a wacky Starbucks name! Every year I see my American friends going wild all over Twitter and Facebook about Pumpkin Spice Lattes appearing in Starbucks again. Until last year, they were purely an American thing, but now Starbucks sells them over here, too! I'm very fond of pumpkin pie and coffee with cinnamon, so I thought I'd give it a whirl just to see what all the fuss was about. After playing with the TouchID on the new iPhone 5s at the Apple Store--pretty damn easy to use--and peering in the windows of pop-up art shops, we wandered over to WH Smith and I hit the jackpot! Now, I have no idea if this promotion is still running beyond the weekend, but, I bought two awesome hardback books for £10. 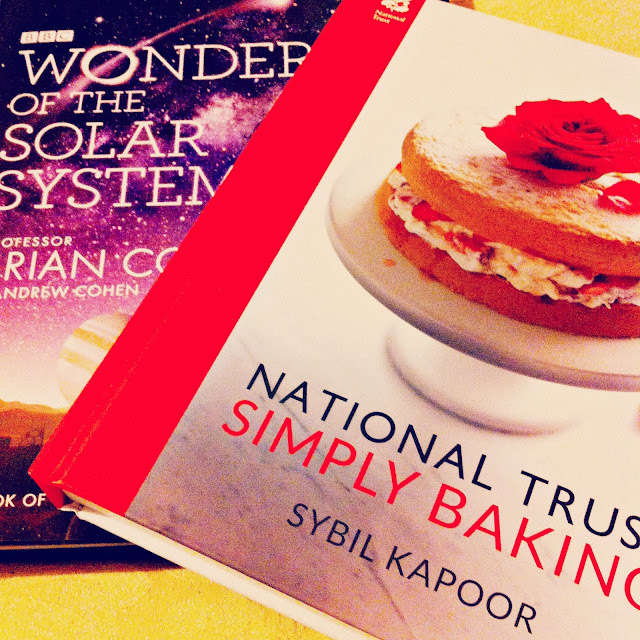 The splendidly smiley Professor Brian Cox's Wonders of the Solar System has a RRP of £20 and the National Trust baking book has a RRP of £25. A hell of a saving! They had a wide range of fairly recent cookbooks in the deal and also lots of 'character guides' for Star Wars, The Avengers, DC Comics, Superman and his foes etc. Potential Christmas presents there! Definitely worth popping into WH Smith on your lunch hour. I've spent several happy hours on the sofa dipping into each book for a page or two at a time so that I can savour them. I'm sure Dave thinks I am insane, but it's a glorious mix of science and cake. The recipes in the NT book are a decent range of traditional and modern, with a few naturally gluten-free ones thrown in for good measure. I'm pretty keen to try the parsnip and cinnamon cupcakes, and the hazelnut brittle cheesecake. There's plenty to keep me occupied in the kitchen for months! Plus I can eat the resulting cake while expanding my brain. Win-win! Later on, after we'd collected Lucas from the party, I also picked up a Kindle copy of The Hundred-Year-Old Man Who Climbed Out of the Window and Disappeared after Miss Melvis pointed out that it was on sale for 99p. It's been on my Amazon wishlist for months, and I just had to snap it up for such a bargain price! I'm really looking forward to reading this! 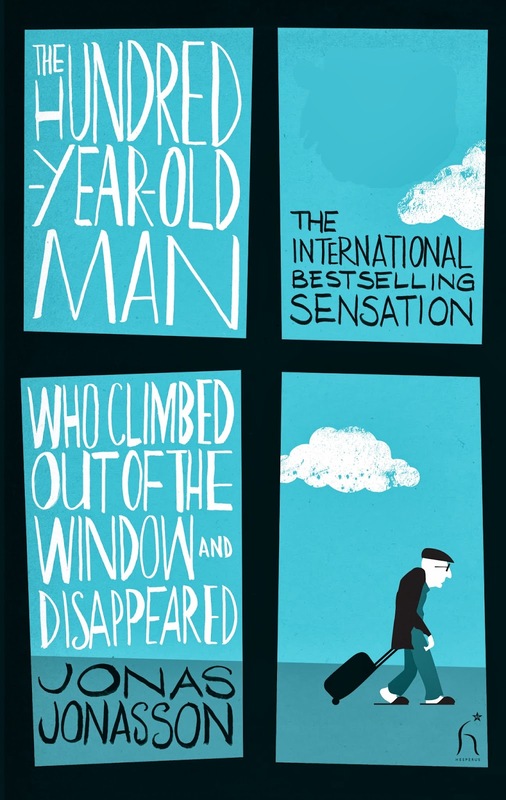 I've got 'The 100 Year Old Man...' too - can't wait to get stuck into it. No spoilers if you finish first! You're likely to get to it before me, M! I have loads of books to read and a stack of comics that it probably as tall as I am. (It's in three mega piles on the study floor.) There just isn't ever enough time to read everything! The Pumpkin Spice Latte is way too sweet. You can ask for it with half the syrup (or sugar) and it helps! I only have one or two a season. And this is funny because I've been asking people lately when it's a good age to leave your kids at the party! We went to a fourth birthday party at a bowling alley over the weekend and my mom said that when we were four, she'd leave us at parties! And I said if that were the case, I'm essentially asking this family to babysit my kid. At a bowling alley. Not cool! I've been consistently leaving Lucas at parties since he was about five. It does depend on the party, though. We stayed at a bowling party he went to when he was 5 as he couldn't lift the balls properly and we feared for his toes, but now that he's six and stronger I happily left him at a bowling party in the summer holidays and went off shopping with a friend. Lord have mercy that pumpkin spiced latte sure looks good.